Help develop your child's emotional intelligence with five bedtime stories on CD. 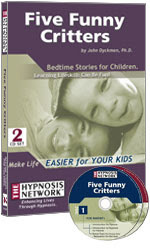 Your 5 to 7-year-old can learn to deal with life's challenges through these gentle hypnotic tales. The next best thing to reading one-on-one with your child, Five Funny Critters will soothingly help your child learn valuable life skills through the power of story. In today's complex, busy world, it's not easy to find the time and the right words to help your child deal with issues that he or she faces each day. Your child will love Five Funny Critters and will be unaware that he or she is learning valuable skills that will serve him or her for years to come. Dr. John Dyckman's engaging style combined with his original music creates a series that is sure to be listened to over and over again. Your child will benefit by learning new age-appropriate skills. And you will benefit because your child is sure to relax and fall asleep!!! These audio hypnotic bedtime stories are a great addition to your current library of children's books. Of course, it's always good to read interactively with your child, and this is not, and never will be, a replacement for that. Yet, as an addition, these stories are sure to be a valuable component to your child's bedtime ritual. Developed by John Dyckman Ph.D., this hypnosis-based program teaches techniques for interacting with life from your child's viewpoint. Your child's unconscious mind will gently learn how to handle the unique situations that a child aged five to seven experiences. When you see how much your child enjoys these stories, you'll regret not having tried these tapes sooner. Once you begin to see the positive effects on your child's behavior, the stressful aspects of parenting might become just a little easier to handle. These stories are designed specifically for children aged five to seven. Five Funny Critters is a 2-CD program.